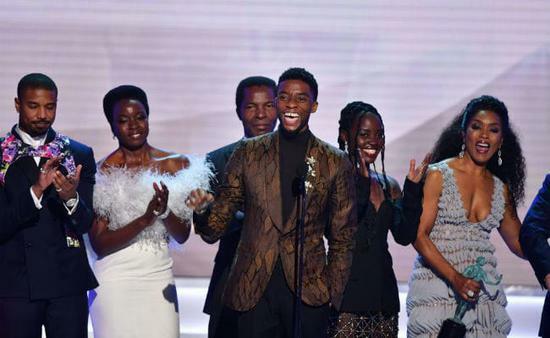 LOS ANGELES, Jan. 27 (Xinhua) -- Disney and Marvel Studios' superhero film "Black Panther" won top film award at the 25th Annual Screen Actors Guild (SAG) Awards held at the Shrine Auditorium in Los Angeles Sunday evening, picking up the best cast ensemble prize. Directed by Ryan Coogler, the film stars Chadwick Boseman as T'Challa / Black Panther who returns home as king of Wakanda but finds his sovereignty challenged by a long-time adversary in a conflict with global consequences. "Black Panther" has more than 700 million U.S. dollars in North America for a world total of 1.34 billion dollars. "Black Panther" became the first superhero film earlier this month to earn a best picture nomination in the history of the Oscar Awards. SAG Awards are accolades given by the Screen Actors Guild -- American Federation of Television and Radio Artists (SAG-AFTRA) to recognize outstanding performances in film and prime time television. It's the only awards ceremony where actors are judged exclusively by their own peers. The SAG Awards are considered as the indicators of likely Oscar success next month.